Oh girl – I’m sorry to hear you had to deal with all of that and are still struggling with it but it’s amazing what food can do to change our bodies and our health!!! I have to say, even though the black coffee would be a no-go for me, the meals you have planned sound amazing!! 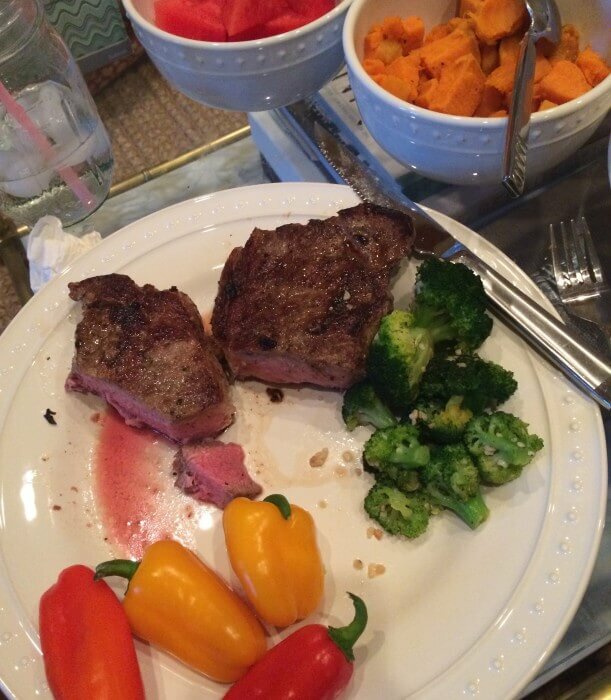 That steak dinner- yes please! 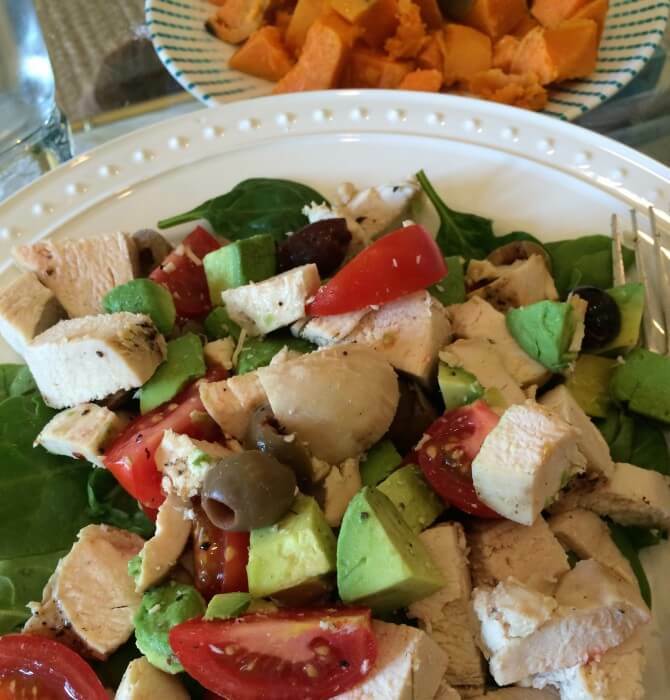 when I did paleo (which I loved… not sure why I stopped), my favorite meals were grilled chicken with a massive scoop of guacamole, or steak with homemade sweet potato fries (coconut oil, yo). I swear I ate guac 5 times a week. so good. good luck! This was a very enlightening read! I, too, suffer from multiple autoimmune diseases. I struggle with pain and exhaustion. I miscarried multiple times because of them. When I was finally able to (miraculously?) carry my son to term, I had a remission of symptoms also. My joints (my back still hurt like crazy) felt amazing and I wasn’t living in a fog. Now, almost 6 months after having my son, I am in a world of hurt, losing hair and exhausted. I am definitely going to start eating clean. It jist takes a little extra time and prep. Anyway, sorry for the long comment and thank you for sharing your journey!!! Those conditions sound really tough to manage, but I’m inspired by how positive your outlook is! You totally look on the bright side of things I hope your new food lifestyle helps with your pain – and I’m excited to see how it turns out! Boo! That just plain stinks my friend Those meals do look pretty darn good. I need to do the same. I’ve had an unexplained rash for years that has gotten better with each pregnancy but still returns occasionally. And, I’m tired ALL THE TIME. I know a clean diet would knock it out of my system. I’m eager to see how things change for you in a few months! Ghee is amazing by the way! I found a good organic one at TJs it is scrumptious on steamed veggies. My favorite meal which I still eat almost everyday for breakfast: banana, almond butter and flaked (unsweetened) coconut from the bulk section, not shredded coconut. Also delicious smoothie: spinach, banana, frzn blueberries, almond butter, coconut milk. I ate guacamole on almost everything and had a million hard boiled eggs. I felt great, but I will tell you the sugar cravings NEVER go away, and days 3-10 are pretty rough going through sugar detox. Good luck! Also, I can’t imagine trying to attempt this while pregnant…you’ve got big kahoonas! New reader and it is so interesting to hear of your diagnosis my mom also has RA and Behcets Disease. She also mentioned that during her pregnancies she felt amazing! So wierd how that happy. I hope that the Whole 30 continues to help you feel better mama!